Call on 9537740627 to pre-book your seats. 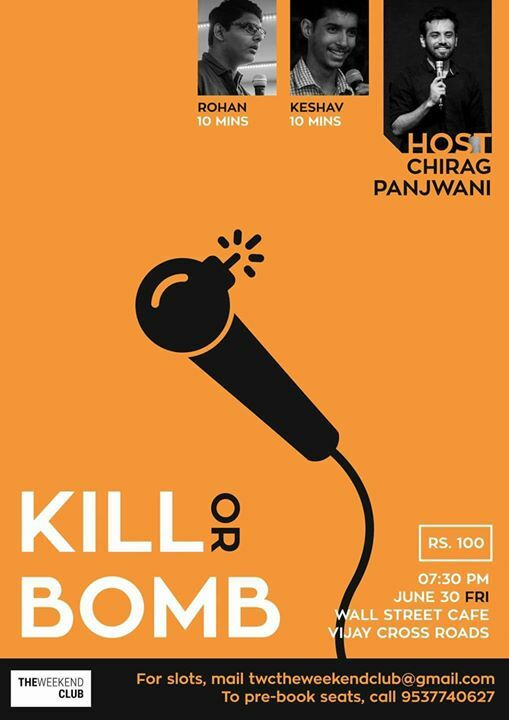 K*ll (Kill) or Bomb is your chance to try your hand at Stand-up Comedy or just sit and laugh for hours as the comedians try out their new jokes and practice some old jokes. Host of the evening is Chirag Panjwani a treat for you. He has performed in various cities across India and now he is ready to tickle your funny bone. Besides him, Some other comics trying out jokes for the first time and also Keshav and Rohan doing 10 mins of fresh material.